The Labour-supporting Momentum group has been fined £16,700 for "multiple breaches of electoral law", the Electoral Commission has said. This included the highest fine issued to a non-party campaign for not submitting an accurate spending return. The watchdog said poor record keeping by the group during the 2017 general election was one of the reasons for the fine. Momentum blamed clerical errors, which was "not surprising" for a new group. 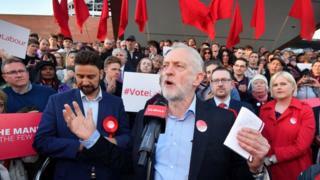 The grassroots group was formed out of the campaign that supported Jeremy Corbyn in his successful 2015 leadership bid and now campaigns for Labour. It is the first time the group has been investigated by the elections watchdog. The group registered as a non-party campaigner during the snap June 2017 general election and submitted a spending return to the commission in September 2017. But the watchdog says a "number of issues" were found and an investigation was launched in November 2017. As a members' association, the group also had to report any donations above £7,500, under Electoral Commission rules. The watchdog found that two donations from the Transport Salaried Staffs Association (TSSA) of £10,000 and £8,000 were not reported within 30 days of accepting them. The group was fined £900 and £450 for these failures respectively. Louise Edwards, the commission's director of regulation, said: "Non-party campaigners are essential for a healthy democracy. "But just as crucial is that after a poll, voters can see complete and accurate spending data. "The fines that we have levied reflect Momentum's repeated revisions to their spending return, poor record keeping and failure to follow advice given by the commission prior to the election." She said non-party campaigners who seek to persuade people to vote a certain way have legal obligations and they should "invest properly in having the right processes and staff to meet their obligations". "Momentum is unlike most non-party campaigners in that political campaigning is its full-time work, so it is particularly disappointing that they have failed to meet the law's requirements," she said. Momentum spokesperson Laura Parker said the group welcomed the findings that it did not overspend beyond the regulated limit in the 2017 general election. She said the watchdog "did find some mistakes in our reporting and some clerical errors", but added that this was "not surprising for a new organisation". The fines were "disproportionate" for "incredibly minor" offences" she added. "There were also various mitigating circumstances which should be taken into account. Momentum was a new, volunteer-led organisation and this was the first time we had to follow the regulations. "We won't make these mistakes again."